The terrorist attacks on September 11, 2001, led to radical changes throughout the world in the way national security issues and possible threats were approached. The most modern surveillance, reconnaissance and communication systems— both on the ground and in the air—now play an essential role in international security policies. 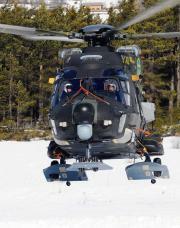 At Heli-Expo 2009 held in Anaheim, California, Eurocopter unveiled the corporate version of the EC175 to the public for the very first time. In June and July, Eurocopter and its subsidiaries will be participating in various air shows and events all over the world.